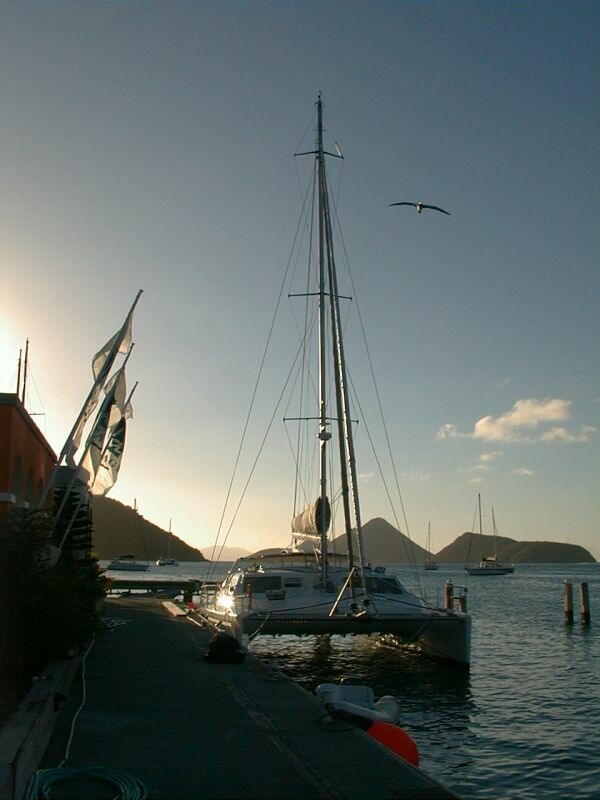 Within a few days after the November 14, 2001 launch of PatiCat, an experienced delivery skipper by the name of Bruce Arderne prepared himself and two young crewmen (John and Patrick) to sail PatiCat to Tortola, British Virgin Islands. Bruce was able to provide several updates during his trip with the use of his Iridium satellite phone. 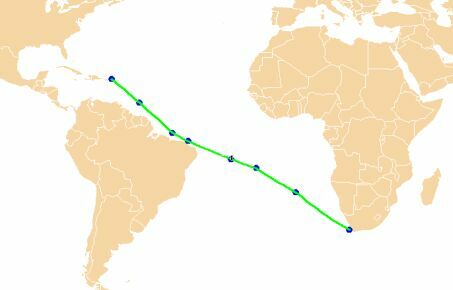 See the picture of his route below. with a logged distance of 5656 nautical miles. They arrived on December 29, 2001 at 1340. 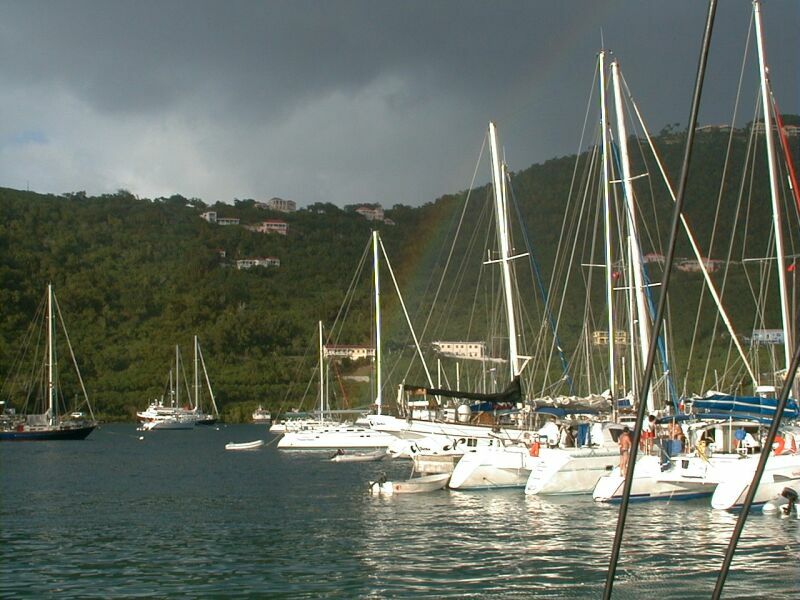 Frank (the Owner) planned his flight to Tortola as close as possible to the estimated day of arrival of PatiCat into Tortola. Late the same evening as they arrived, Frank arrived and saw the boat for the first time. An exciting time - even if no one was around. The delivery crew was "mysteriously" absent - it turns out they were enjoying a well-earned party-night out. Frank managed to "break" in through an open hatch and begin to explore the boat, and finding the owner's stateroom clean - went to sleep. Late the next morning, the delivery crew showed up on a neighboring boat. They noticed Frank's baggage on the boat when they returned (in the wee hours), and chose to sleep on another boat rather than disturb the new Owner. Very nice of them! They immediately put some finishing touches on what was already a mostly clean boat. They had taken considerable measures to avoid damaging the boat during the delivery. Frank spent two days taking off plastic coverings, getting a briefing from Bruce on the boat systems, and beginning to provision the boat for the trip to the States. 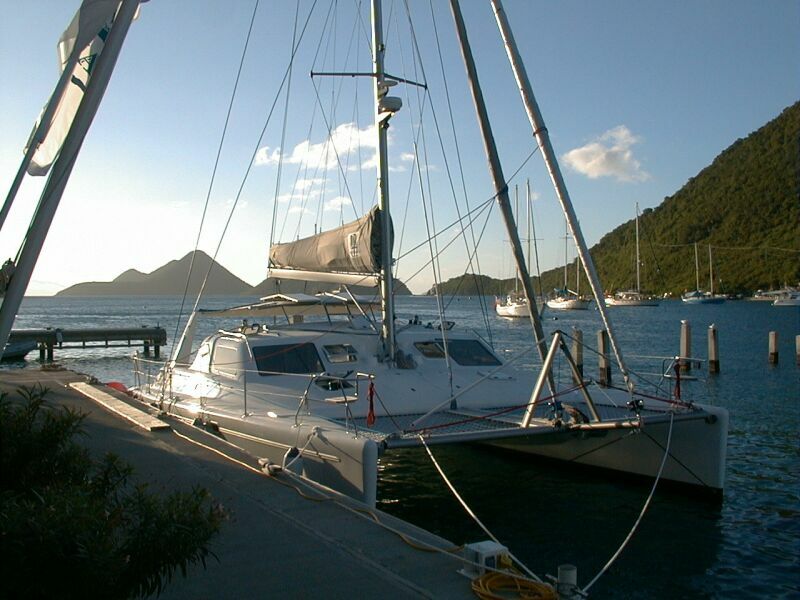 Despite the hectic period during the holidays, the staff at Voyage Charters BVI (thanks to: Robin Downing, his wife Jo Ann, and their staff - primarily Ed) were able to assist Frank with several new-owner issues and with the provisioning. The electric oil pump for changing oil was especially appreciated. Also, some details with options such as the Apex 12' dinghy and it's anchor and bridle needed to be completed. But, the important details were handled despite the New Year Holiday being nearly the only days the staff normally takes off. Karen (Owner #2) arrived on New Year's Eve (she had to make final arrangements at home for the kids, so she came separately). 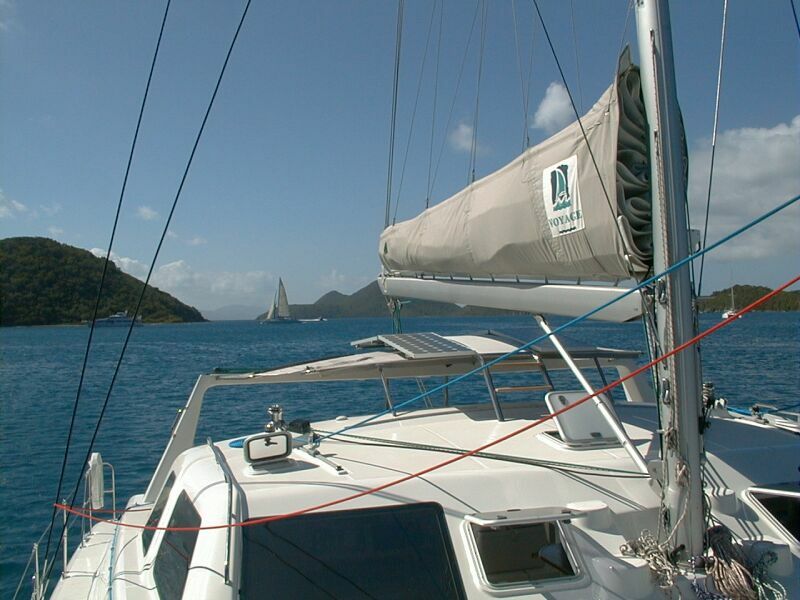 Frank and Karen christened the boat by pouring champagne over the two hulls, and celebrated New Year's Eve on PatiCat. What a way to start the New Year! 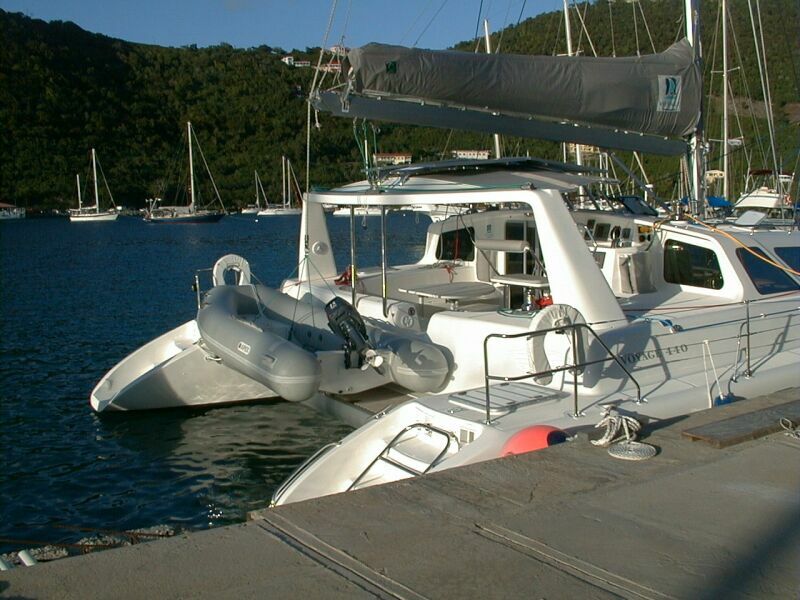 Frank and Karen chose to deliver PatiCat from Tortola, BVI to Jacksonville, Florida on their own. Read about the successful and satisfying trip to Jacksonville, Florida. And make sure to check out the pictures as well! © Copyright 2002-2007 by Frank Taylor. All rights reserved.